I am Pragya, CEO of The Art Tiffin and Organiser of TEDxFPWomen events. I live in the north-west near the sea with my two-year-old twin girls, my eldest daughter who has just graduated from Cambridge, my Scottish husband, and our cat, Belle and dog, Taylor. I did my PhD from Nottingham and was a Senior Academic in the US and UK Universities, and now run a social enterprise and think-tank about gender diversity, creativity and mental health. I am a TEDx speaker and I write about parenting, feminism, art and mental health for Huffington Post and Forbes. I run an active facebook group for parents ‘Raising Creative Kids’ and an art subscription which is a comprehensive learning programme to introduce children (ages 4-10) to various artists. What are you children’s favourite books? Our house is filled with books, and so they move quite quickly from one to another. I usually let them choose whichever they want to look at even from the ‘grown-up’ bookshelves. One of my eldest’s favourite book used to be ‘The Scarecrow and the Servant’ by Philip Pullman when she was little. My twins loved Gruffalo’s Child for a while, and Peter Rabbit, especially after we visited the Beatrix Potter Exhibit in the Lake District. They absolutely love ‘Press Here’ by Herve Tullet at the moment which is such a simple but very effective idea. It is just so imaginative and innovative, and really makes them giggle. Which book do you most like reading to them? I really love reading James Mayhew’s ‘Katie and the Sunflowers’ to them. It is a lovely book that introduces Van Gogh and Gaugin’s work to children in a very friendly and accessible manner. This really complements my own work in creativity and STEAM, and my parenting ethos of taking children to art galleries from a very young age. The book expands a child’s imagination, and helps them understand colour, visual culture and art techniques. I used to love Enid Blyton books. Growing up in a small town in India, we did not have access to many English Language books for children, so I used to save my pocket money every month to buy all the Famous Five books. I remember reading all my grandfather’s books when I was very young, including collections by Shakespeare and George Bernard Shaw by the time I was 11 years old, I absolutely loved Gone with the Wind. Roald Dahl is an all-time favourite, because he writes from a child’s perspective and never talks down to children. He creates magical, funny, and outrageous worlds, where it is ok to be different. I would have to say, Quentin Blake, because, his illustrations are so iconic and instantly recognisable, so simple but full of personality. Amongst the more recent ones, I love Axel Scheffler. I recently went to the Nosy Crow office and saw some of his original sketches and illustrations there, and I really admire how his sketches bring the words alive. What do you look for when shopping for a new book for your child? I am constantly looking for something that entertains, challenges and inspires them, with beautiful pictures. At the moment, my 2-year-olds are into interactive books with sounds and flaps, and those that are inspired by nature. I look for books for them that have multiple layers of information that we can discover together as they grow older. I look for diverse characters and those that are not gender-specific. What would you like to see more of in kids’ books today? I would love to see more diverse characters and stories, as it is so important that children hear different voices and experiences, and see children that look like them. It is important to me that my children know more of and take pride in their Indian heritage. I would also like to see more universal themes that are gender neutral, rather than those that perpetuate stereotypes. 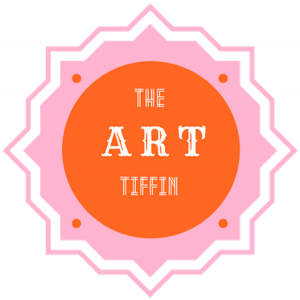 The Art Tiffin is a social enterprise aimed at encouraging creativity and creative thinking. Creativity is very important to me in bringing up my own children, as is storytelling through images and words. I write about this on my own blog, but also for Huffington Post. 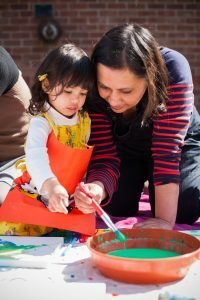 The Art Tiffin box fosters a love of art and culture from a young age. It is inspired by Montessori principles, based in psychology, child development and art education, and built by educational experts. It is a unique learning programme, progressing from one month to next. It is convenient, as all the research is done for you, and it is delivered as a self-contained activity box through your letterbox each month, giving endless fun and family time. It is not just any other art and craft box; it is a complete learning programme through play, while helping children develop confidence in their creative skills and abilities. We donate to mental health charities, and to orphanages in India from all proceeds.